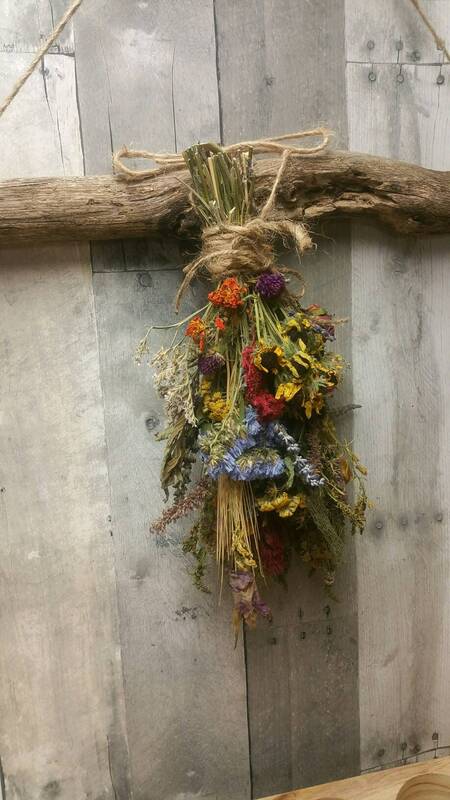 These dried herbal bouquets are Made to Order. Pictured is a sample of Vintage Farmhouse Autumn theme. Dried Muted Pastel flowers and botanicals in mauves, purples, blues, yellows, dried lavender and more in a bundle tied with jute and a loop jute hanger. Delicately made with care for your home decor enjoyment and love of nature and its beauty. Measures 12-14 inches tall and approx. 5-7 inches wide. Wrapped in Your choice of tissue paper. Kraft, White, Yellow, Green, Purple. For an extra charge: Cats, Butterfly, or Birds. Makes wonderful and amazing decor for your home hanging in your kitchen, bedroom or living room for a nice year 'round decoration. Please note: This listing does not come with wooden limb rack or wooden holder as pictured, but is for display use only.